I am touched by their food. If you can only dine in one place in the city of Kaohsiung, this is it, unless you are a Muslim. 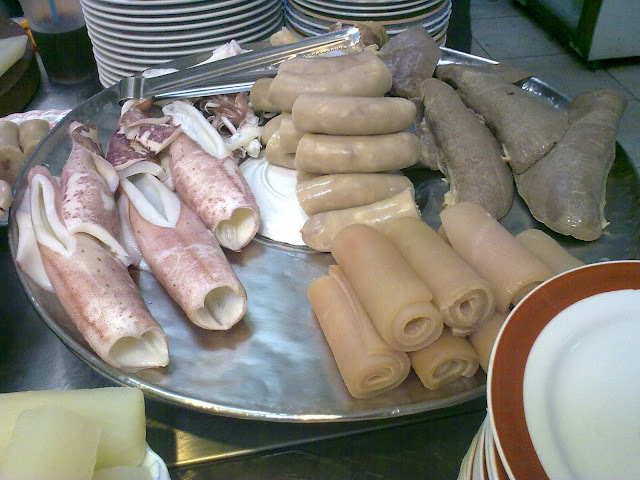 Almost every dishes contains, more or less, pork products, including veggies. Occasionally, I am touched by the food. That has happened very few times. In addition to the impeccable execution on preparing the dishes, I feel the chef has put in a piece of his/her soul in to his/her master piece, and create a resonance. Once such a chef sold her business. The new chef knew I was a regular, and was dying to know if the food was as good as before. Apparently, the old chef also left her recipes. The new chef's food tasted identical to the old. However, I no longer felt "touched." This is a restaurant that makes me feel "touched." This place is my Ratatouille. The style of this restaurant is authentic traditional Taiwanese. The dishes severed here can be found in thousands of places on the island. The method of cooking is quite simple. Most of the dishes are boiled. As we all know, great chefs are capable of turning ordinary into extrodinary. As the name of the restaurant suggests, it does noodles right. My personal favourites are meat soup (rougeng, NT$40, about US$1.50), and rice noodle broth (mifentang, NT$40). The broth here are made of pork bones. Hence the excellent meat broth (guzairoutang, NT$40). The pick the meat off the bones from the making of broth, and put the meat back into a bowl of broth. Many dishes are not on the menu. You have to talk to the chef and/or point to order at the counter. If you are not adventurous, stay with veggies. Most of the time, chives, bean sprout, and yam leaves (fanshuye) are available. Otherwise, go nuts. 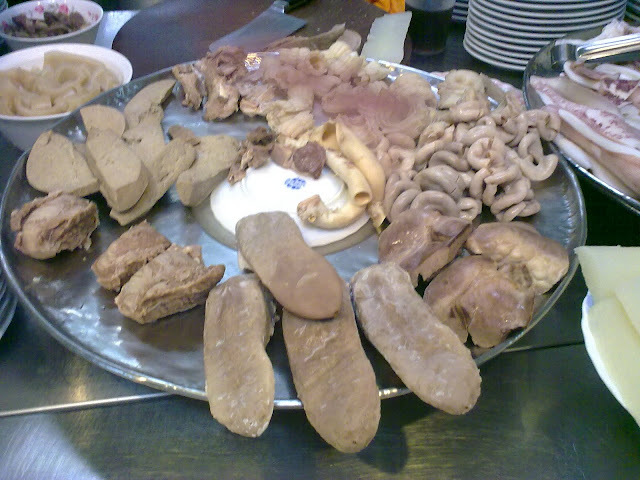 There are all parts from a pig, except meat, lying on the counter waiting to be ordered. Please use the dipping sauce. "This restaurant was established in 1954. The original owner, Ah Jin, learned how to prepare and sell noodles since childhood. He has been a street vendor since he left home town Tainan to Kaohsiung. He settled down on today's Lainan Street more than 10 years ago. In order to perfect the broth, not only did he made the broth from pork bones, he also made garlic and green onion Taiwanese Schmaltz himself, instead of buying them already made. Ah Jin also made sure his qiezailiao (those on the counter to be ordered stuff) is fresh and dilicious, in the hope of complete satisfation of every customer." Strongly recommended. Liver is always a charllenge to chefs, as it is freaking easy to over cook it. This place does it perfectly according to Taiwanese standards, for Taiwanese prefer not to see blood in their meat.